Posted 23:40 by epilektric & filed under How To. 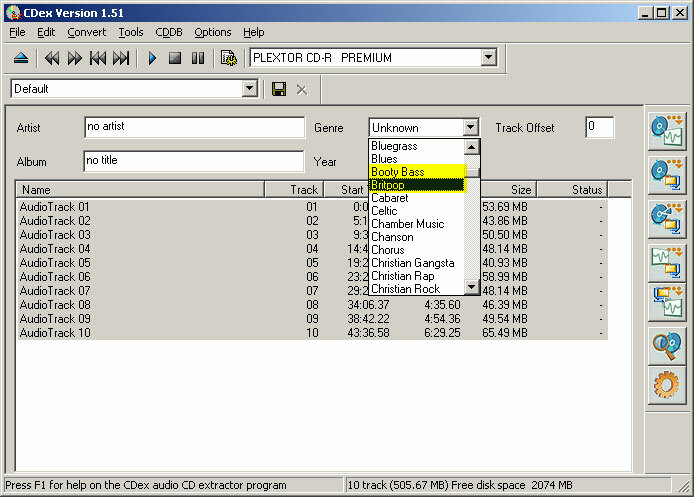 While trying to rip a CD the other day I noticed that Breakcore was not on the list of pre-approved listening genres. Although it may indeed be an acquired taste I found it a bit insulting that it wasn’t on the list. Being a pull down list I wasn’t able to type a new genre directly into the field. Surely there was a way to add new genres to the list I thought. 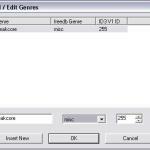 Some quick Google searches didn’t reveal a method for adding new genres but it did reveal that a file called CDexGenres.txt resides in the program’s local CDDB directory. I anxiously opened the file to find that it was empty. 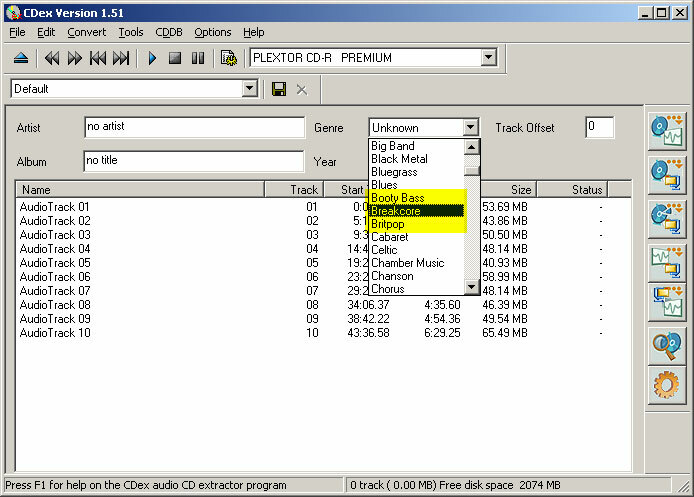 I concluded that the program itself comes stocked with the default genres and this file was for new additions. Unfortunately I had no way of knowing what format the program expected to see these new genre additions in. Again I queried the all-knowing Google. Only this time I used a special operator in my syntax to find any other copies of CDexGenres.txt that might be lingering around. Having discovered a copy of the file that was not empty I was able to determine the correct formatting. 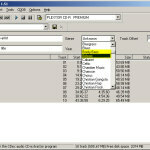 Here’s how to add new genres to the list in CDex. Navigate to CDex’s local CDDB directory. Mine is located at C:\CDex\CDDB\ but yours may be different. You can find the location of yours by opening CDex and navigating to Options->Settings->Local CDDB. In the CDDB directory you’ll find CDexGenres.txt. Open the file in a simple text editor (like Notepad). If you double click the file the default Windows action is to open it in Notepad so that should work fine. Save the CDexGenres.txt file and restart CDex if it’s already running. You’ll now find the new genres in your list. Thanks to commenter Penny Hassett for alerting me to the add/edit genre feature in newer versions of CDex. The new feature is called “add/edit the list of genres” and is located under the Edit menu. Sadly, the genre category cannot be edited so you will need to refer to my previous steps if you want to add more. 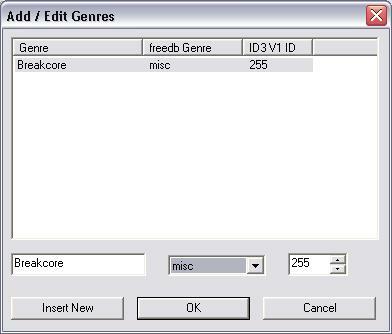 For example, the image above shows the genre of Breakcore in the category of Misc because the category of Electronic wasn’t an available option. To be fair, I have no idea if there is an official list or not. © 2019 Epilektric. All Rights Reserved.